RT's Spanish channel and pan-Latin American network TeleSUR in Venezuela launched a new joint project on Monday, aimed at providing a different perspective to Western mainstream media. Titled “Venezuela and Russia. At gunpoint” ("Venezuela y Rusia en la mira" in Spanish), the project will feature a series of programs about the two countries and other international news relating to them. Broadcast as a telebridge, the format of the show will enable discussions between the studios on the two continents. Hosts in both Moscow and Caracas studios will be joined live by experts from Latin America and Europe, to discuss news issues concerning both Russia and Venezuela. US sanctions and joint efforts at creating a multipolar world are expected to be some of the program’s hot topics. The two channels have previously had a broadcasting partnership, with TeleSUR having shown some of RT's programs to its audiences. The two channels have also exchanged videos and other news content, including correspondents' broadcasts during breaking news coverage. 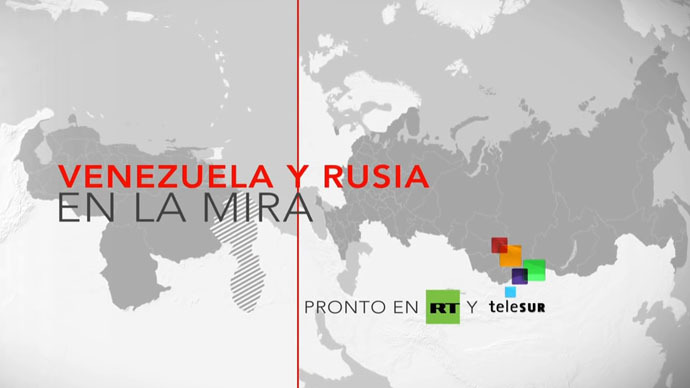 RT's Spanish channel has already been widely present on TV screens across Venezuela. It joined the country's state TV network TDA last year, and has also launched its broadcasting there as part of one of the world's largest satellite service providers DIRECTV.